As a personal trainer every year I have to redo my CPR. 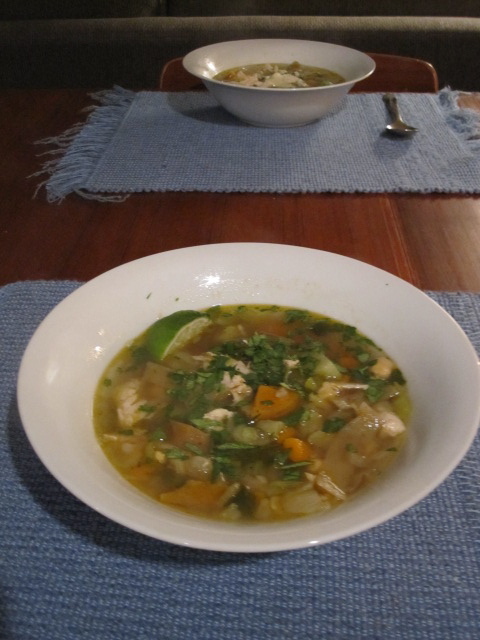 When I showed up for the class a few weeks ago my instructor said “I was sick last week and my husband made me your chicken soup recipe – thanks for that”. As we sat there doing chest compressions all I could think of was “what chicken soup recipe”. 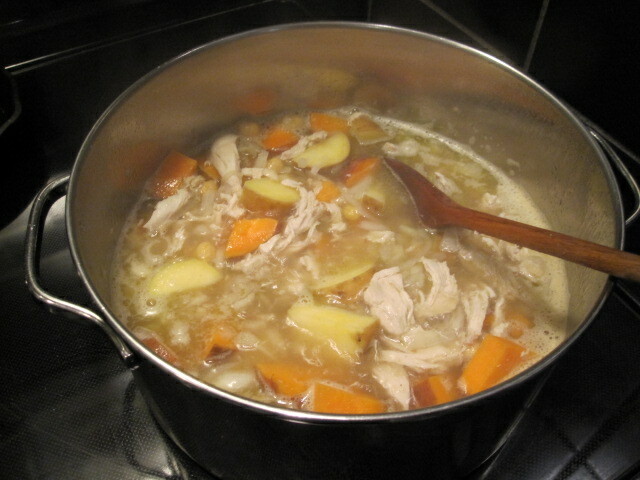 Then, a couple of weeks later I got an email from a client asking if I could please send her my recipe for turkey soup. Hmmm. Taking it as a sign I went through some of my old newsletters to see what they were referring to. Ah ha! This soup has been floating around my kitchen for so long I don’t even think of it as a recipe anymore. Originally from the cookbook The Best of Cooking Light (2000), it is super easy, healthy and satisfying. Exactly what you want in a chicken soup. Now you will probably get around to making soup before you take CPR. Personally I strongly suggest doing both. However unlike this recipe, I hope the CPR never comes in handy. * Trying to eat less meat? Simply eliminate the chicken and add extra beans. Heat the oil in a large soup pot over medium-high heat. Add 1 cup onion and saute 3 minutes until just soft. Add oregano, cumin, and garlic and saute another 1 minute. Add stock, potato, and chickpeas. Bring to a boil, and cook 5 minutes. Add chicken/turkey, corn, salt, and zucchini; cook 5 minutes. Stir in tomato and cilantro; cook 2 minutes. While soup is cooking place toppings in individual bowls. Ladle soup into bowls (Note: a standard serving of soup is approx. 6oz). Serve all bowls with a wedge of lime and garnish with your toppings of choice. This entry was posted in Cooking, Food, Herbs, Lunch, Recipe, Soup and tagged avocado, beans, cheese, chick peas, chicken, cilantro, coconut oil, CPR, guacamole, herbs, hot sauce, lime, onion, potato, turkey by mostlynoodles. Bookmark the permalink. Seriously people, if you are in Vancouver LifeLink are the people to take CPR from! And I’m glad you like the soup!